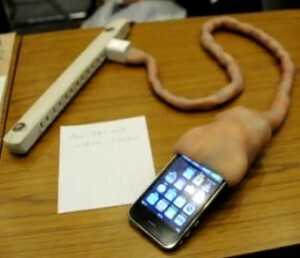 This is one iPhone charger that might gross you out. Japanese electronic stores are offering a new iPhone charger that promises to make charging fun and engaging. The charger is a terrifying umbilical cord! Even the power line to the charger is just the extension of the umbilical cord. Apple surely has not seen this coming. Blogosphere reported that this was a creation of a Japanese media artist Mio I-Zawa and was displayed at Ogaki Meeting in Japan. A quick look at Mio I-Zawa’s site will feature a mechanical tumor stuck to your computer’s chasis. You can check out Mio I-Zawa here and the Ogaki Meeting website here. Check out the iPhone charger video. Next Nuclear Powered Car Might Soon be a Reality! Wow that is really crazy and gross I dont even think I would be able to use it.